ADASUVE® (loxapine) inhalation powder, for oral inhalation use, is a typical antipsychotic indicated for the acute treatment of agitation associated with schizophrenia or bipolar I disorder in adults. 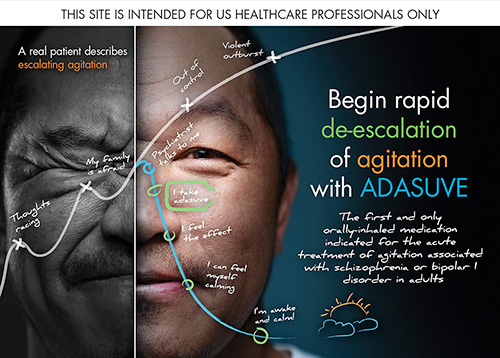 Efficacy was demonstrated in 2 trials in acute agitation: one in schizophrenia and one in bipolar I disorder. Limitations of Use: As part of the ADASUVE Risk Evaluation and Mitigation Strategy (REMS) Program to mitigate the risk of bronchospasm, ADASUVE must be administered only in an enrolled healthcare facility. ADASUVE can cause bronchospasm that has the potential to lead to respiratory distress and respiratory arrest. Administer ADASUVE only in an enrolled healthcare facility that has immediate access on site to supplies and personnel trained to manage acute bronchospasm, and ready access to emergency response services. Facilities must have a short-acting bronchodilator (eg, albuterol), including a nebulizer and inhalation solution, for the immediate treatment of bronchospasm. Prior to administering ADASUVE, screen patients regarding a current diagnosis, history, or symptoms of asthma, COPD and other lung diseases, and examine (including chest auscultation) patients for respiratory signs. Monitor for signs and symptoms of bronchospasm following treatment with ADASUVE. ADASUVE [package insert] Galen US Inc., Souderton, PA; 2017. Data on file. Galen US Inc.
Zeller SL, Citrome L. Managing agitation associated with schizophrenia and bipolar disorder in the emergency setting. West J Emerg Med. 2016;17(2):165-172. What is prevalence? National Institute of Mental Health website. https://www.nimh.nih.gov/health/statistics/prevalence/index.shtml. Accessed September 17, 2017. US Department of Commerce; United States Census Bureau. State & County QuickFacts. https://www.census.gov/quickfacts/fact/table/US/PST045216. Accessed September 17, 2017. Allen MH, Currier GW, Carpenter D, Ross RW, Docherty JP; Expert Consensus Panel for Behavioral Emergencies 2005. The expert consensus guidelines series. Treatment of behavioral emergencies 2005. J Psychiatr Pract. 2005;11(Suppl1):5-108. Dinh KV, Myers DJ, Noymer PD, Cassella JV. In vitro aerosol deposition in the oropharyngeal region for Staccato® loxapine. J Aerosol Med Pulm Drug Deliv. 2010;23(4):253-260. ©2017 Galen US Inc. All rights reserved. You are now leaving the ADASUVE website. Because of the risk of bronchospasm, ADASUVE can only be administered in healthcare facilities that are enrolled in the ADASUVE REMS Program. By clicking the above link, you will leave ADASUVE.COM and be redirected to the ADASUVE REMS Program site. 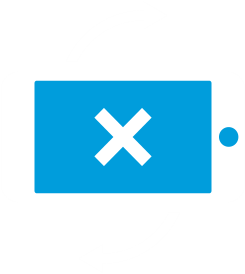 Please rotate your device to portrait view to return to the site.